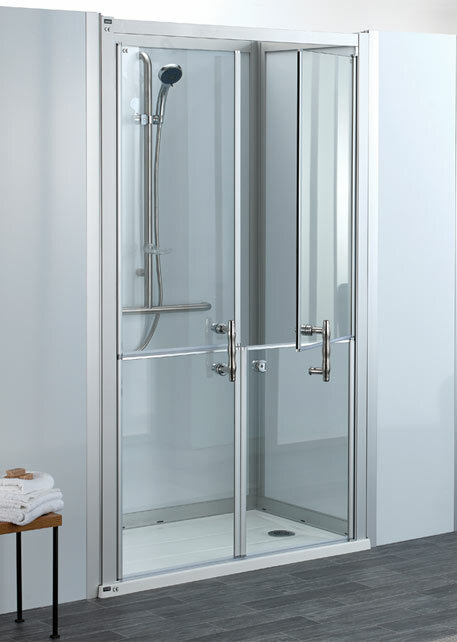 Our shower cubicles are self-contained enclosed units and can be installed in an upstairs or downstairs room. Ideal for those who need to have their bathing solution nearby. Simple to Install, includes full instructions and fittings. Does not require any tiling and only requires the services to be connected. Is surrounded on either 2 or 3 sides, and has a large choice of full or half height, corner entry or saloon doors. Cubicle can be installed as a permanent fixture or relocated easily in any room either upstairs or downstairs. Half height door version comes with curtain rail and curtain. Optional extras include a roof and ramps for assisted Wheeled Shower Chair access. Maximum height of the cubicle is 2050mm (Base 32mm / 40mm). Base 32mm / 40mm: Choice of waste 50mm or 90mm Ø inlet / 1½” Ø outlet or a pump waste (will require our waste pump). Base weight capacity 380 kg / 60 stone (Bariatric). Access base 275 kg / 43 stone.